Do you currently own a saltwater pool or want to convert your chlorine pool to saltwater? 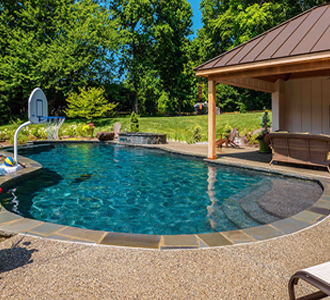 Our experts at Lothorian Pools have years of experience building and servicing saltwater pools in Baltimore, Carroll and Harford County. A saltwater system creates a better, healthier swimming experience for most people. In a saltwater pool, the water feels soft and your skin feels smooth and refreshed. Saltwater pools are NOT chlorine free pools. However, it is not necessary to handle or buy chlorine tablets with a salt generator. A saltwater pool system essentially produces its own chlorine, which prevents algae and bacteria, and kills microorganisms. Chlorine is generated at the filter system by splitting the sodium chloride molecule. This newly created chlorine is less harsh than traditional chlorine tablets, meaning it is healthier and safer for your hair, eyes, and skin. The amount of salt in a saltwater pool is negligible – 3,000 parts per million – as compared to a tear (12,000 parts per million) or the ocean (33,000 parts per million). The interesting fact about salt generation is that while chlorine levels at the generator are at a super-chlorinated level, 10 parts per million, the chlorine recombines with the water over the length of the piping and the result is a chlorine level of 1 part per million in the pool, which is the same level as municipal drinking water. This residual chlorine present in the pool eliminates algae and waterline scum build-up. Lothorian Pools will assist you when it’s time to open or close your pool to ensure that your saltwater system is up and running properly in the spring, and is properly winterized when it is time to close it down. Our experts will sample your pool water to check pH, Alkalinity, Calcium Hardness, Stabilizer, Salinity and other levels to give your pool the necessary chemicals required to properly balance your waters, so that it remains clean and sanitary. Are you ready to speak to our pool experts about our saltwater pool services in Baltimore, Carroll or Harford County? If so, give us a call today at 410.667.7665 or contact us online where a customer service representative will be in touch with your shortly.